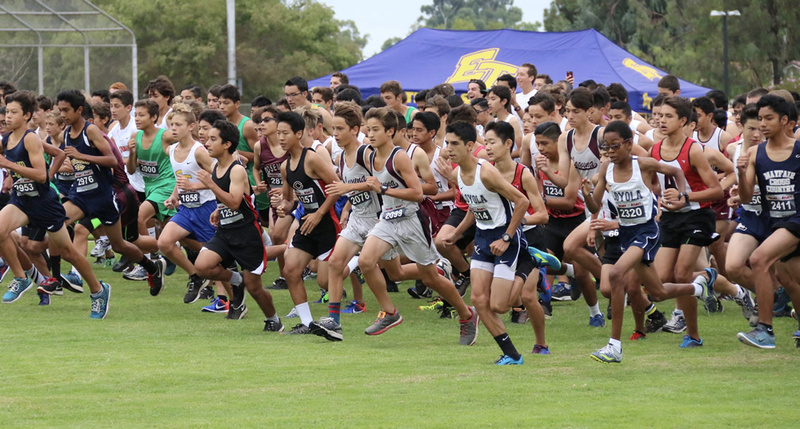 Freshman Laguna boys at their season opening race in Cerritos on Saturday, Sept. 3. A group of Laguna Beach High School cross country runners competed Saturday, Sept. 10, in Morro Bay, while others raced in Laguna Hills. The Morro Bay runners were led by Sebastian Fisher with a 16:15 time, besting Luc LaMontagne by just 3 seconds. The Laguna Hills race resulted in Laguna’s fastest finisher Andrew Doudna at 19:56 in the sophomore race and in the freshman race Tanner Burton at 19:58. The boys squad returned from Morro Bay with the junior-senior team finishing fifth and the frosh-soph team getting third place. Luc LaMontagne had the top time at 16:15 followed by Cal Nielson, Zachary Falkowski and Dylan Miller. Laguna non-varsity girls competed in the Laguna Hills invite. Girls travel to Seattle this weekend for the 25th Annual Sundodger Invitational at Lincoln Park in West Seattle.